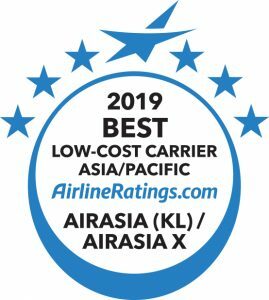 AirAsia and AirAsia X Malaysia have been awarded Best Low-Cost Carriers Asia Pacific for 2019 in the industry-led AirlineRatings.com Airline Excellence Awards. Judged by a panel of industry experts with a combined 200 years of experience, the awards bring together four major international industry and government safety audits alongside demonstrable leadership in the areas of innovation, value and passenger comfort. AirAsia Group CEO Tan Sri Tony Fernandes said, “We are proud to be recognised as champions and thrilled to see our industry peers appreciate the efforts we’ve made in areas of operational safety and innovation. AirAsia Malaysia recently jumped from a 4/7 star safety rating to an impressive 7/7 stars, following its completion of IATA’s independent IOSA audit in September this year. Long-haul sister airline AirAsia X Malaysia moved points this year to a 4.5/5 star product rating, following its commitment to redefining premium low-cost travel with its award-winning Premium Flatbed. AirAsia X Malaysia CEO Benyamin Ismail said, “These awards are testament to the incredible efforts of our Allstar staff who live and breathe our values ‘Safety Always’ and ‘People First’ each and every day. Commenting on the award, AirlineRatings.com Editor-in-Chief Geoffrey Thomas, said “The win was richly deserved. Mr Fernandes and AirAsia X Malaysia Chief Executive Officer Benyamin Ismail have done an outstanding job guiding the airlines to their market dominant position. The full awards list can be viewed at airlineratings.com.